Ah, blogging in the wintertime. The light fades quickly, and bloggers scramble to take photos before the darkness of evening strikes. But guess what, you guys? You don’t have to worry about lighting any more! Three years ago I decided to invest in some lighting equipment for my Etsy shop so I wouldn’t be shackled to shooting during daylight hours only, and also so the quality and crispness of my photos could improve dramatically. It took me quite a while to figure out what the heck I was doing and what equipment I should buy. So I thought I’d make it easier for someone else starting out in studio lighting to understand what to purchase, how to set up a photo shoot, and how to effectively use lighting equipment to mimic daylight. Here are a few tips and tricks for lighting your blog and product photos using artificial lighting- plus, tips for utilizing window light if you don’t have the money to put towards a lighting setup just yet. The photo above was taken using only artificial lighting from my studio strobe flashes. Because of the brightness of the lights I used in my setup, I was able to take the photo at a higher shutter speed, at a lower ISO, and at a wider aperture, increasing the sharpness and quality of the final image. Without artificial lighting, I’m forced to shoot on sunny days, near a window, and still have to deal with issues like shooting at a high ISO (decreases image quality), using a low f# (found in expensive lenses, and makes it so only one point of the image is in focus), and worrying about camera shake with a low shutter speed. Check out the equipment I use below, and then take a gander at how I set it all up. Strobes vs. Continuous lighting: Some photographers choose to shoot with continuous lighting, but I don’t because it uses a lot of energy and puts out a lot of heat during a photo shoot. Strobe flashes put out bursts of light only when you take the photo, and then recharge for the next photo. This is more energy efficient, but it also isn’t great for action shots, because if you take a photo too quickly after the previous one, the strobes will not have charged yet, and the subsequent action photos will be dark. 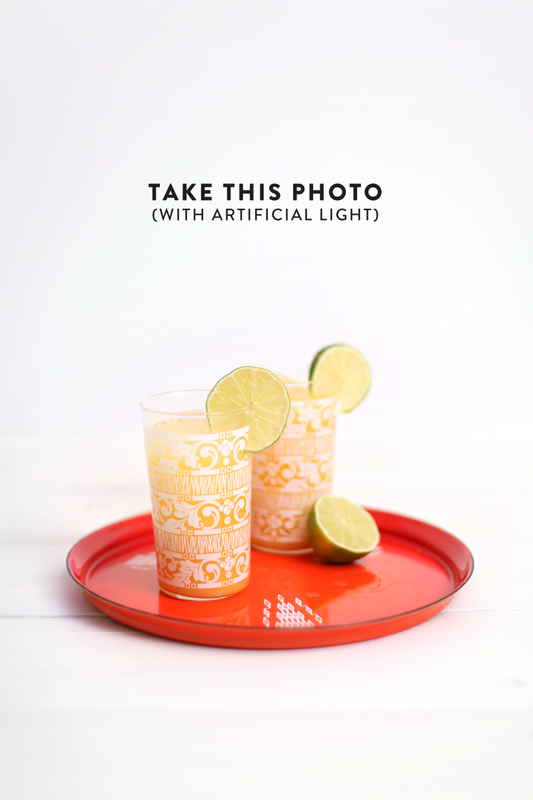 So, strobes- great for product photography, not toddler photography. Also, the bright flashes probably aren’t good for babies. But this isn’t portrait photography tips, it’s blog and product photography tips! Bouncers & Diffusers vs. Light Umbrellas: When I started out on my studio lighting adventure, I bought a lighting kit that came with umbrellas. I wish I hadn’t. I quickly found out that the umbrellas weren’t going to give me the even, diffused lighting quality I desired, so I bought these two big softboxes instead. Well, time went on and I found out through trial and error that even the softboxes weren’t giving me that diffused lighting that one might find in a bright, white, open space. Since I couldn’t afford to rent out a studio space with the openness, big windows, and white walls I wanted, I began to experiment with bouncing my strobe lights off of large white foam boards in my own living room, and loved the look I got. The only problem was bringing home the huge pieces of foam board from the store (I borrowed my parents’ van), and then storing them at home when I wasn’t using them. Finally, I purchased two huge reflector/diffuser rings that collapse for easy storage, and I couldn’t be happier! The light I get from them is pure white, and they’re super easy to use. Below you’ll find the equipment I use the most with links for buying them on Amazon. They are inexpensive compared to better brands, but they’ve served me well. This is all you really need for a nice studio set up for nighttime blog photo shoots and product photography in your own home. The prices listed below are what I pay with my Amazon Prime membership- the prices may be different for non-members. To get started, set up your subject how you want, but I like using a white backdrop (either white paper, mat board, or foam board) and a white “table top” I made for photos. 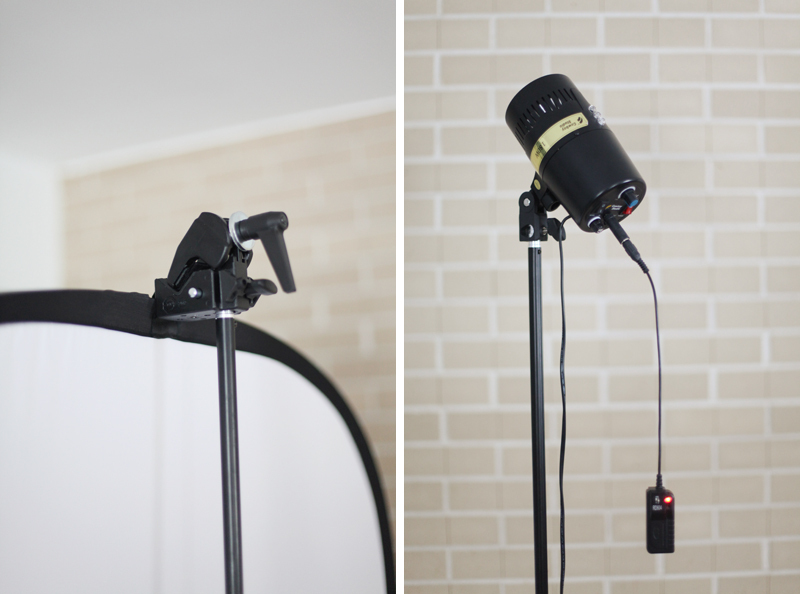 Now set up four light stands, and screw your strobe flashes onto the top of two of them. Attach the remote receivers into the backs of the flashes and set their frequencies to match each other and to match the hot shoe flash trigger (found in the set I linked to above) that you’ve slipped to the top of your camera where an external flash might go. Set one light directly to the left of your photo setup, and point it towards the photo. You can vary the height of the light according to your desires, but I like this side light to be situated lower that the other light. Now, look at the dial on the back of that flash you just set up, and make sure it’s set as low as it can go. Place the second light diagonally in front of the subject you’re shooting. The photo shows this light situated somewhat close to the subject, but in actuality I shoot with it a bit further away, in front and to the side of the subject. Point the light upwards and away from the subject, and set the dial on the back to mid-range. 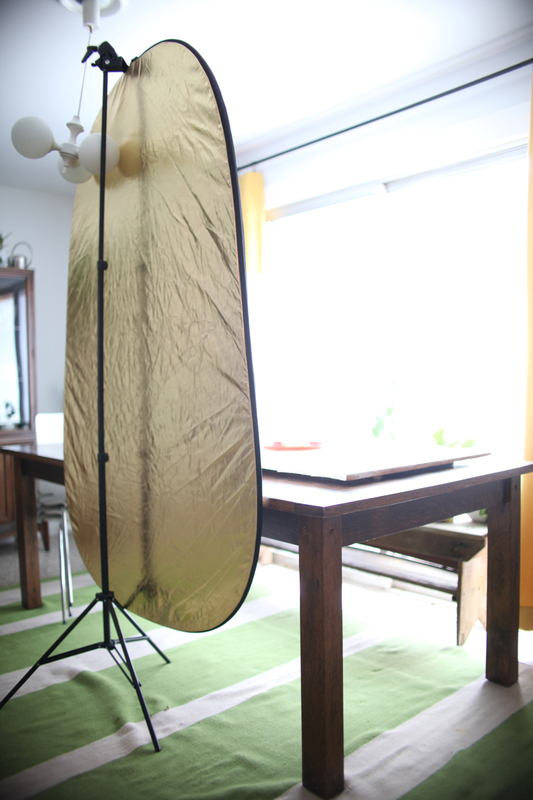 Now, pop open the two collapsable diffuser/reflector rings. The diffuser/reflector ring that I linked to above is great because it’s actually 5 things in one- it has a gold reflector, a silver reflector, a black “flag,” a white bouncer, and, if you unzip and remove the cover, it reveals a white light diffuser. Put the super clamp on top of your remaining two light stands, and attach the diffuser on onto one stand, and the reflector on the other stand by fitting the straps of the reflector rings into the super clamp. You will use the white light diffuser in front of the side light, just about two feet away from the light, in between the strobe flash and the subject. Position the white reflector/bouncer (these terms are interchangeable for my purposes) in front of the other light, which should be pointed towards the reflector/bouncer and away from the subject. This setup will result in a soft light coming in from the side, and a nice, even light coming in diagonally from the front of the subject. The front/diagonal strobe should cast light that is slightly brighter than the side light, creating natural looking shadows in the final image. When you take photos using this strobe flash light setup, you will need to practice and experiment with the settings on your camera. Because the strobe flashes are way brighter than the lighting in the room, the light meter on your camera won’t help you select your camera settings. You should definitely have your camera on a manual setting, and start with your shutter speed set somewhere between 150 and 200, because that’s the speed that should sync with the speed of your strobe flashes. Use your camera’s manual to see how to change the shutter speed on your camera if you’re unfamiliar with the manual setting. Your f# can be low if you wish (as long as your strobe flashes aren’t too bright), but I like to keep mine around f/2.5-f/3.0, so that there is still a nice depth of field, but more of the photo is in focus than what you would get with a lower f# like f/1.4. Once you have the shutter speed set to around 180, and your f# is where you want it, then take a few photos, adjusting your ISO until you get the lighting just how you want it. Your ISO will probably end up being really low, which will result in some very high quality images. Don’t be afraid to play around with the positioning and power level of your flashes until you get the shadows just how you want them. I like to move the strobes out further than my setup photo shows, but you might not be able to do that if you’re working in a small space. If you have pure white ceilings, you might try pointing the front light up to the ceiling to bounce the light off the ceiling for a really nice diffused light. Just be aware when bouncing light that if what you use to reflect the light isn’t a neutral white, it will cast its hue onto your subject matter. 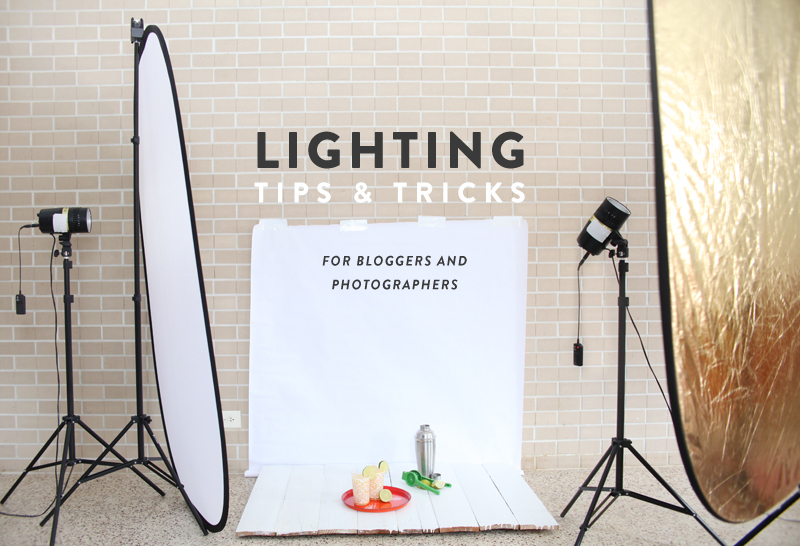 Owning lighting equipment has literally changed my life as a DIY blogger. I can now take photos and work on projects whenever is convenient for me, regardless of the light (or lack thereof) that’s coming through my windows. If I start photographing a subject in the morning, but finish photographing it in the evening, my artificial lighting setup guarantees consistent lighting in all of my photos. But if you can’t afford to acquire this whole setup right away, I would definitely suggest starting out with a light bouncer/diffuser like this. It’s a good size, it’s portable, easy to store, and will give you a perfect neutral light in your photos, unlike the warm white of foam board. All you need is some natural light! On a typical day, especially in the Summer when the light is brighter, I shoot photos using only the light from the largest window in my house. I set up my subject on our dining room table, which I push close to the window. If the light coming from the window is very harsh and bright, I place a diffuser ring in front of it the offending beam of light. I prop up a white mat board behind my subject and then set up the white bounce side of my other ring reflector opposite of the window, so that all of that beautiful light can bounce back onto the darker side of my image. Above you can see three unedited versions same image, taken within minutes of each other using the same exact settings on my camera. The first image uses just the light from my window, which creates a nice image, but uneven lighting from one side of the image to the other. It would do in a pinch, but I prefer a brighter image without such dramatic lighting. So for the second image, you can see how different the same setup looks using the white bounce side of my ring reflector. It seems like I took the photo in a gorgeously lit room, but in actuality the lighting in my dining room is less than ideal, so the ring reflector is my photographer’s life saver! The third version of this image uses the “black flag” side of my ring reflector, which creates a moodier image. The black flag absorbs light from the left side of the image, resulting in dramatic shadows, a lighting effect known as chiaroscuro. This look is great for use with dark backgrounds and a sumptuous subject matter, like chocolate cake drizzled with ganache and topped with a luscious ripe cherry. Yummm! Chiaroscuro is great for emphasizing drama, but seeing as how I’m probably dramatic enough without dark shadows, I usually prefer brighter images for my photography, so the white bounce gets used most often in my work. I hope this guide has been helpful for any beginning photographers or bloggers who are looking for more flexibility in their work and studio arrangement! This post is the beginning of a photography miniseries on Making Nice in the Midwest which is designed to help bloggers make their work even better. I originally planned this series to be an online class available for purchase, but instead of asking you to pay for the class, I thought I’d make the content available to you for free, but I’m sharing the equipment I use with affiliate links. If you enjoyed my tips and want to purchase your own equipment, doing so by following the links in this post will give me a small percentage of that sale and help pay for more content like this at Making Nice in the Midwest. I love this. It’s so useful and something I have been curious about for a while but never really fully understood how to use the equipment. It looks scary and confusing but when it’s all explained out clearly, it’s so much easier to understand! I found your blog through a Pin a few minutes ago and I love your blog! This is one of the best posts about photography and lighting I’ve ever read. Thank you so much Mandi for taking your time to share your experience with us. You must have put a lot of work into writing all those great tips, so please know that they are highly appreciated! :) I’m exactly at ‘this stage’ where I know I need artificial light and I have no clue where to start. My last purchase was a tripod and since I’m quite comfortable with it now – I want to move on and not worry about the weather outside anymore – that would be so great! thank you for this detailed and helpful post! I just got an external flash for my camera and I’m already loving being able to take my food photos at nighttime. I really want to get a white backdrop and faux tabletop to really make my photos even better. thanks again for being so helpful! Such a great, informative post! I am definitely the one scrambling to get photos while the sun’s still out, and I’m normally hesitant to use artificial lighting, but this is great!! Bookmarking immediately! Many, many thanks! Taking photos in Sweden is a challenge this time of year. The light is fading really early and I have a problem getting my photos taken in time. Think I’ll be on Amazon tonight! 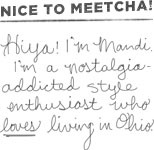 Thanks so much for sharing Mandi! I really struggle with lighting for my blog photo shoots. I’ll definitely reference this when I decide to purchase lighting equipment. Thank you very, very much for this really easy and detailed explanation; it was very helpful and I’m definitely going to buy a light bouncer now! These tips are SO helpful! I’m so grateful :) I have a decent DSLR but don’t get around to using it much, but I want to change that. I also would love to have the full set up but definitely want to get that set of diffuser/bouncers. Thank you so much for this! 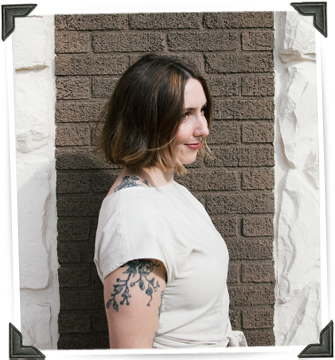 I’ve been having quite a bit of trouble with blog photography. There’s literally a 1 hour span where can take pictures with natural light, as long as it’s not snowing, windy etc. This is so helpful! Many thanks! Great post, I’m so grateful, especially for the photos that allow us to compare the different tricks. I’m really new to blogging AND photography and I’ve got far less stuff than you do, I still found good tips! I love your other blog as well. Nice post. I’ve been contemplating buying strobes for awhile now and had no idea they could be so inexpensive. I’m curious, if I purchase the 180 watt strobe will you still receive some commission? I hope so. I think so. :) That’s really sweet of you to ask! I take SUCH horrible pictures, as I know nothing at ALL about photography. This was absolutely fascinating to me! Thank you so much for taking the time and trouble to post all of this. I need some serious help, and I think I can utilize some of your suggestions to at least be able to light things better. Just practice, practice, practice! And read about whatever you’re trying to do at the time. It’s too overwhelming to try to learn everything at once. That’s my advice from someone who not too long ago was right where you are! What a wonderful post. As someone who is planning to launch a blog in the next few months, posts like this are invaluable. You are so sweet to take the time to share this and have made the learning experience much more manageable/less intimidating. Thank you! Thanks so much for sharing these tips, Mandi. I get really frustrated at being limited by daylight hours to take my blog photos, so it’s great to read how you get around that. Thanks for taking the time and trouble to share your experience. Lighting for photos is something I don’t really know much about, but you’ve inspired me to give it a go! Mandi, thanks so much for sharing this insight and info. I am constantly struggling with getting blog projects done with natural light, and I have a feeling an artificial studio lighting setup would change my life for the better. BUT I added everything up, and your setup cost about $365, which is way out of my budget. So, do you have any thoughts on what is most useful if we can only afford to upgrade a few items, or ways to save money? Would smaller (cheaper) reflectors still be useful? Is there anything special about those clamps, or would cheaper ones work? These are great lighting tips. This is a great post, thanks so much for the detailed info! I know you prefer the strobe lights but would you have a recommendation for a similar setup using continuous lighting instead? Of course you could use continuous lighting too! I zero experience with it, but the principles are the same. I’m not sure if you can adjust the strength of continuous lights, so that’s something to consider. The strobes definitely allow for that, which I love. Hi, I have a question unrelated to the actual post (which was great! Thank you) what font family did you use over the pictures? The bolder and the thinner one. I understand if you don’t feel like replying to this but it would be immensily appreciated if you did. Thanks! Thank you so much for this post! It was exactly what I was looking for. I’ve been on Amazon looking at equipment and was clueless. So easy with your list. In my cart now. This is super useful. I appreciate you sharing the trial and error that you went through before you got to your ideal kit. Pinned this onto my Photography set ups board so I can refer to it again and again. As an online shop owner, I take a lot of photos. Your post is so incredibly helpful! Thank you, thank you, thank you!!! I’m going to be taking a look at the products you suggested as well. This is one of the most informative posts that I’ve come across when it comes to lighting. I just read your prime lenses post on A Beautiful Mess (another great post) and I’ll be bookmarking your blog for future reference. I love how you explain things so simply. Loved this info! I have ALL of this in my cart! I just launched an online clothing website and looking to start taking photos myself! 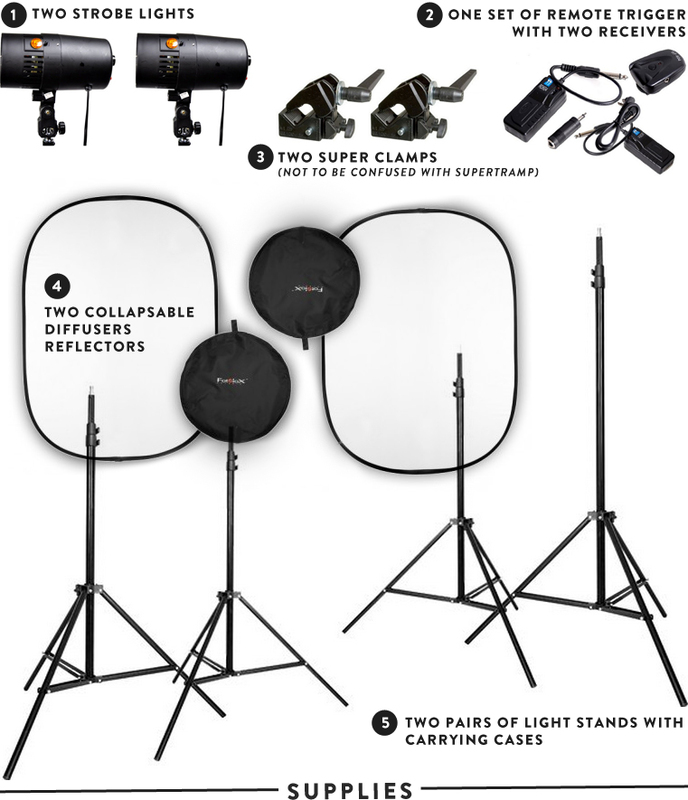 Were the light diffuser/bouncer packs a 2-3 month wait when you purchased? Such a bummer! I just ordered new remote triggers (I broke mine! Gah! ), and they said 2-3 month wait. It ended up being a one month wait. But still! Annoying to have to wait. Oh no! Hopefully mine don’t break! Got everything in the mail yesterday and had so much fun setting up and testing out! Going to be following your step by step this weekend- really want to get a more natural look to my site photos and I think you post shows that perfectly! WOW – SERIOUS LIFE CHANGER!!!! Just wanted to say thank you for sharing your expertise. I ordered this equipment a few weeks ago and just got around to using it – my photos look amazing, and I took them at midnight!!! I work full time and run a small independent business on the side, so being able to take good photos on my schedule is really helpful. Thank you also, for providing this tutorial + info free of charge, and for using sponsored links – it’s very kind of you to share your knowledge for free, and I was beyond happy to say “thank you” via your links. This is a great post, and specifically helpful to me because I’m very limited on space for shooting. I think I was over complicating the process. Thanks for the helpful tips! Wow! This post is amazing! I have had it pinned for so long in hopes of putting it to use once my studio space was ready, and it’s almost time. Do you think this equipment would be sufficient for taking pictures of larger scale products? I sell vintage furniture and am looking for a way to photograph it just like this. Please let me know what you think. Thanks so much! Thank you again and much love! Awesome! Does this set up work for shooting photos of models? Or is it just for still and small objects? Thank you! Yes! I used it for shooting my product photos for my Etsy shop. It just required more space so the lights weren’t too close to the model. White ceilings help. You can see the photos from this style of setup on the sold items from my old Etsy shop, Fine & Dandy Vintage. All of the shots with this model are from this kind of setup: https://www.etsy.com/transaction/162437928? Youu make iit enjoyable and you still are for to keep it wise. I ccan not wait to read much more from you. This is really a terrific site. I’m just starting to venture into product and studio photography after 30 years of shooting Sedona nature photos outside. This post has been extremely helpful… thanks for the tips! I would just recommend understanding that you may never get the completely diffused/all around light that you would get with more lights. That’s fine! Just work with what you have. Think about it as if you have one window in your home that you’re using a source of light. You would probably light things from the side, and put a reflector on the opposite side. But that doesn’t mean you can’t try backlighting or using more dramatic shadows. I wrote a post about 3 lighting styles for natural light photography which can easily be used for artificial lighting, but I don’t think the post will go live until after the holidays. Wish I could share it sooner, but it’s for A Beautiful Mess, the other website I write for, and they’re waiting to publish it. Thank you so much for writing this article! This gave me so many ideas to implement for my photography and my blog. Thank you. If I am going to only use this to take pictures of items for my style page (shoes, skirts, tops, jewelry) do I need 2 bounces and 2 of everything else? Hey there! Regardless of what you are shooting, you will need the same set up unless you want different lighting. 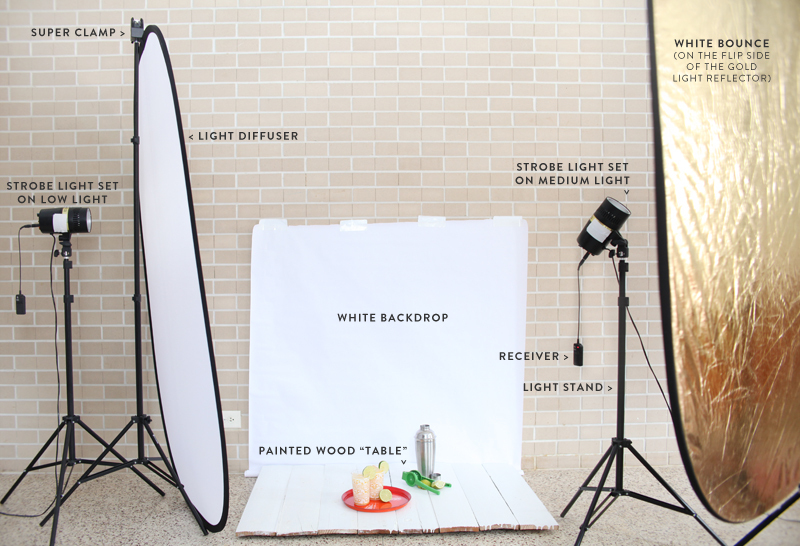 This is everything I’ve found you need for even, diffused lighting. I’ve been working with artificial lighting for years and this is the setup that has given me the sweet spot. If you use less light/bounces, you will get more pronounced shadows. For even lighting, you need the light to come from all around, hence the need for more lights and bounces. You will still want to get some natural shadows by making one light a bit brighter than the other, but you won’t get the harsh shadows from only using one light or one bounce, etc. This isn’t even as expensive as I expected it to be. Nicely done. Very helpful. I am hoping those set up might help when taking pictures of quilt projects for pattern cover. Great tutorial! And not as expensive as you’d think. Thanks for sharing. This is such a great post. So informative and useful. I can’t wait to buy up and try it out myself! Hi! I love this post so much I bought everything and so far it seems to be working really well! Additionally I bought these (http://www.amazon.com/gp/product/B004AZ38Z0?psc=1&redirect=true&ref_=oh_aui_detailpage_o00_s01) clamps to place at the bottom of my posterboard so it would stand upright. But I also realized that they do a great job of holding up the diffuser and white bounce when placed on the light stands! They work really well so I ended up returning the super clamps. Just thought I’d share to help other people save a few pennies! Thanks you so much for the information. 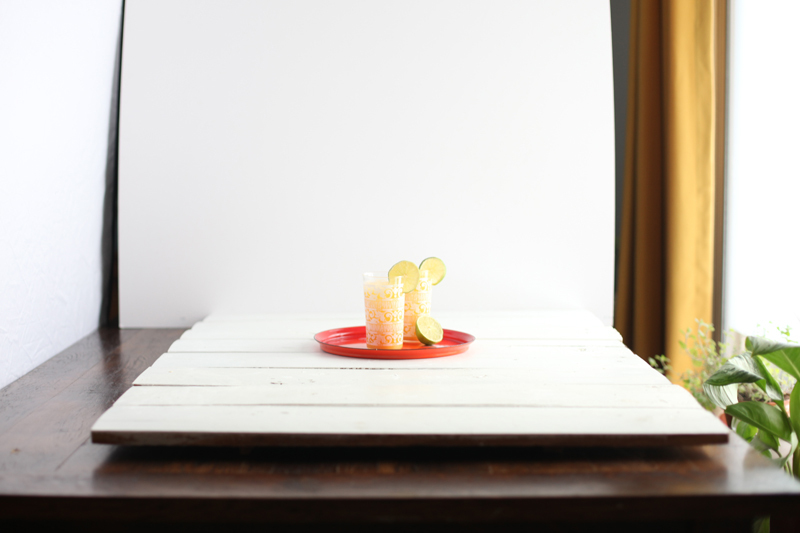 I want to be a better food photographer and I have been searching and found your site. I am ordering everything Your recommended. Thanks again and also for offering it for free. Hope it all works out perfectly for you! Glad I could help. I have a question the strobe flash I bought would it work with a cannon powershot. I think I need to update my camera. Thank you for sharing! This is some really great information! Do you mind sharing what you use for your background to take product photos? Thanks! But can you tell about model and producer of light you use and remote triggers? Because I’m about to buy same equpment for food shooting. Hi Hilal! It’s actually not a table. Just some boards I found in the garage from a previous owner, with staples in them, that I cut down to pieces and painted white. :) I use it as a neutral backdrop for most of my DIY posts. Hi its very useful for me and I learning some object and lighting,..
Great information. Thanks you so much for the information. 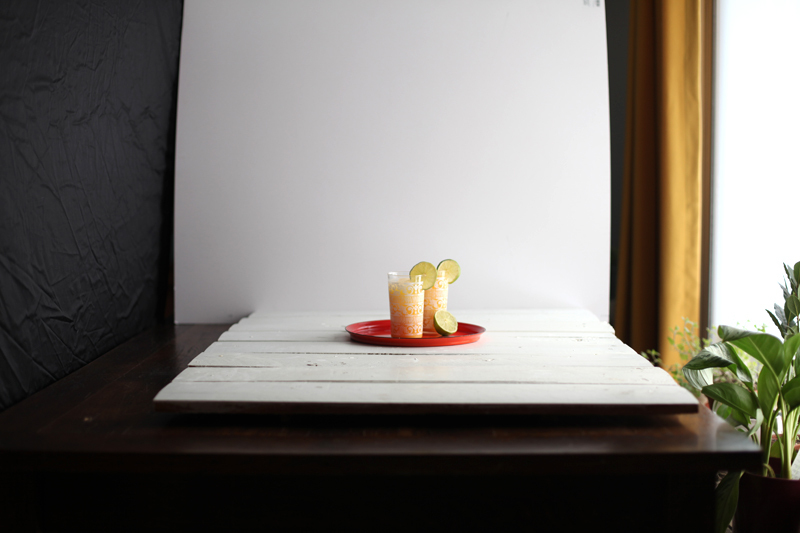 I want to be a better food photographer and I have been searching and found your site. This is EXACTLY the information I have been scouring the internets for! I’m so lost when it comes to setting up the right light in my house with NO natural light! Thank you so much for writing this post! Thanks so much for this amazing info! I’ve bought all the things that you suggested and they’re all working when I click the Test button on my remote. But it doesn’t seem to want to flash when I click the button on my Pentax SLR camera! I can’t find anything on the net, so I’m hoping you can let me know if you need any special cable to connect the remote part to your camera or if you just put it on the top of your camera where the flash normally would go. Thanks! Sorry Mandi I’ve just figured out why they weren’t working! How I fixed it is that I just turned the speed settings on my camera and it worked :-) Thanks again for this amazing tutorial. It’s by far the best I’ve ever come across. This was such a useful article! Really helped many of my unanswered questions! Can I ask what brand your strobes are? They look really compact- just what I need! Hi! I’m ready to purchase my artificial light set up seeing as how we are headed into the darker months, and this blog post is the best and most informative one I’ve read! It’s been two years, any new tips on gear or preferences? Otherwise I think I’m just going to purchase this set up! Thanks again for helping out bloggy friends!